Breakfast is often called the most important meal in everyday life. This is because our bodies need enough energy to initiate the activity, after the body fasting during sleep for about eight hours a day. The breakfast menu usually be presented with a quick, easy and practical. But not for the reasons to be fast, then you ignore the nutritional content and calories in it, especially for those who are dieting. Research shows that people who eat breakfast are typically leaner than no breakfast. One reason is, breakfast with high fiber foods are slowly digested and can help avoid overeating during the day. Here are some breakfast recipes that are very healthy, low in calories, and high in fiber, which can be created in just a few minutes. If you want to lower cholesterol levels in your body, then you must be smart to eat foods in the morning. By eating oatmeal every morning, then a very low calorie diet that will help you protect from atherosclerosis. Mix oatmeal, eggs, pepper, and salt, shake until evenly distributed. Pour oatmeal mixture, stirring quickly until the oats dough is cooked and clotted. Lift. Put a piece of lettuce on a piece of bread, add the oats scramble on it. Breakfast should arouse your appetite and not too much trouble. 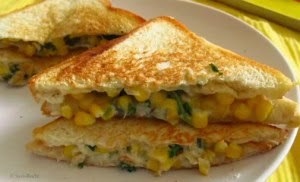 But make sure it contains vitamins, protein, and beneficial substances to the body such as the sweet corn sandwich. Smoothies are always a favorite choice at any time, because it is very easy to make. Consuming this smoothie is a great way to boost your fruit intake with all the vitamins, minerals, immune enhancer antioxidants contained by the fruit. Combine all ingredients in a blender. Stir all the ingredients are more or less about 30 seconds. Once well blended and smooth looks like a milkshake drinks in general, turn off the blender. Place a healthy breakfast in a glass to be enjoyed as a complement your morning time. Eggs are an ideal food for breakfast because it is rich in protein as well as easy and fast presentation. One large egg contains 70 calories and meets 13 percent of the daily protein needs. You can make an omelet of two eggs that only produce 150 calories. Or, you could make a sandwich of two pieces of toast with poached egg stuffing. Various kinds of fruit can be a healthy breakfast if you are rich in nutrients that are low in calories. Low-fat yogurt topped with fresh fruit or apple slices spread with peanut butter could be the right choice.